Netdata is a free, open source, simple and real-time performance and health monitoring tool with a beautiful web front-end. 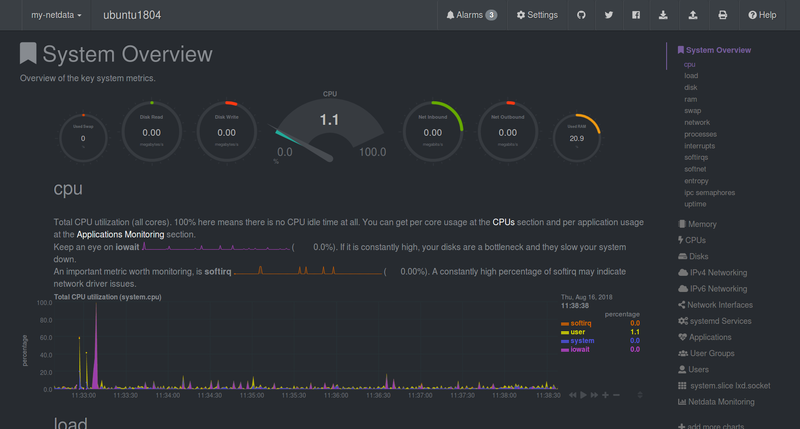 You can monitor CPU, RAM usage, disk I/O, network traffic, Postfix and much more using Netdata. Netdata gathers real-time performance data from Linux, FreeBSD, MacOS and SNMP devices quickly and effectively. In this tutorial, we are going to look at how to install Netdata performance Monitoring tool on Ubuntu 18.04 LTS (Bionic Beaver) server running VestaCP. Once Netdata is installed, you can proceed to the next step. By default, Netdata default configuration file located at /etc/netdata/netdata.conf. Now, open the file and change the server loop back address to your server's IP address. Aug 16 06:03:01 ubuntu1804 systemd: Stopped netdata - Real-time performance monitoring. Aug 16 06:03:01 ubuntu1804 systemd: Started netdata - Real-time performance monitoring. Netdata is now installed and listening on port 19999. Open your web browser and type the URL http://yourserverip:19999.